"The helix is an incredibly powerful and versatile tool for my session and solo work. In theatre playing it allows me to easily access and program any sound required and I love the snapshot mode for quickly changing complete rigs (sometimes multiple per song). For ‘Middle Kids’ and other bands I use it as an intuitive pedalboard running into backline amps. I also love it as a recording interface both in studios and when on the road." 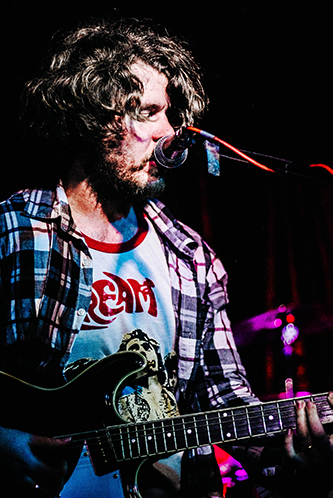 Cameron Henderson is a session guitar player/solo artist from Sydney who is highly regarded for his versatility across many styles. He has worked in a diverse range of projects including professional theatre shows, bands and studio work. In 2017 Cam was lead guitar for the Australian premiere season of ‘Muriel’s Wedding’ (music by Kate Miller-Heidke and Keir Nuttall). 2018 has seen Cam join ‘Middle Kids’ as touring guitarist playing internationally with the band in London and the U.S.A.
Cam also records and releases his own music under ‘Cameron James Henderson’ and is highly regarded as a songwriter. In 2016 he released his debut solo album ‘Storm Rollin’ In’ and toured his own band throughout Australia. Cam has an honours degree in classical guitar from the Sydney Conservatorium of Music and wrote his honours thesis on ‘non-western music on the classical Guitar’.